Today, we need not be a musician to make music. In audio, we the listeners are blessed differently from our performing counterparts in making music; we make music through our audio system. The most gifted of music lovers hear music in his mind, and while we may not share the same gift to the same extent, listening to beautiful music playback through a high-end audio system is an intense experience all of its own. Studies have shown that it is particularly beneficial for a fetus to hear music in the womb of its mother, so that it may develop a heightened sense of sound and music, as well as intelligence. I had a singularly intense music experience during my recent visit to Aaudio Imports in Parker, Colorado in December, 2015. Since my last visit in 2010, Brian Ackerman, president of Aaudio Imports, had progressed in the collection of music-making abilities of electronics and speakers. 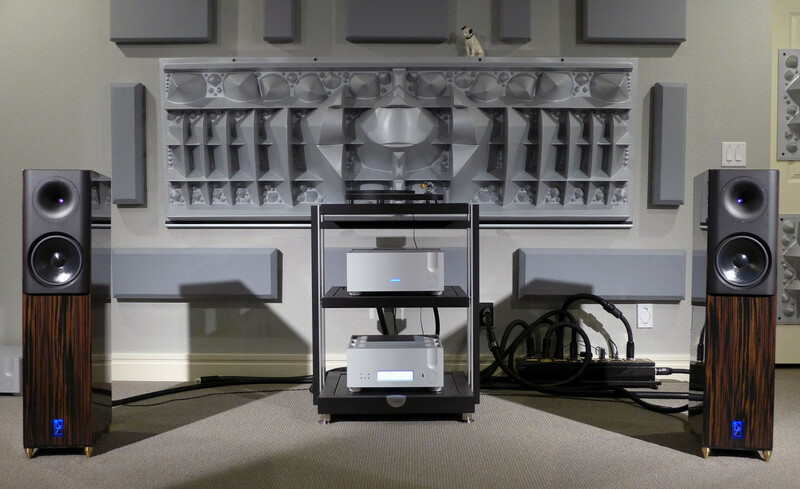 In the 24′ x 20′ x 9′ listening room strategically adorned with custom acoustic panels, two pairs of Lansche speakers were set up on opposite short walls. 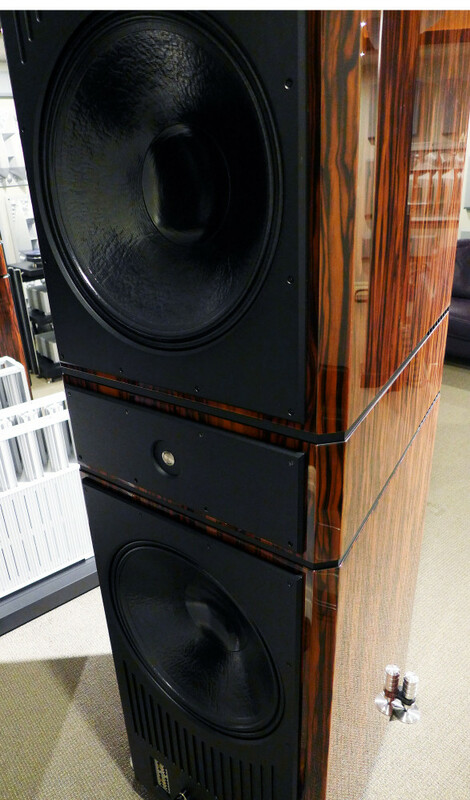 A pair of Lansche 3.1 ($36k/pair, High Gloss Veneer) announced its mesmerizing presence on one short wall with its glowing ion tweeter awaiting action, while a pair of Lansche 8.2 ($276k/pair, High Gloss Veneer) towers over the opposite wall. Audition began with the Lansche 3.1 first, as Brian believes I would lose interest on the smaller Lansche if he let me listen to the 8.2 first instead. The smaller Lansche is a 2.5-way passive bass reflex design featuring the company’s unique Corona ion plasma tweeter. It is accompanied by an 8-inch coated paper mid-woofer taking over at 2.5 kHz, while a 9-inch polyester woofer fires downward internally below 80 Hz. Two circular vents are situated near the top at the rear. At 92 dB efficiency at 8 ohms, the 3.1 weights 112 pounds each and measures 38.6 inches tall, 9.5 inches wide and 15.4 inches deep. 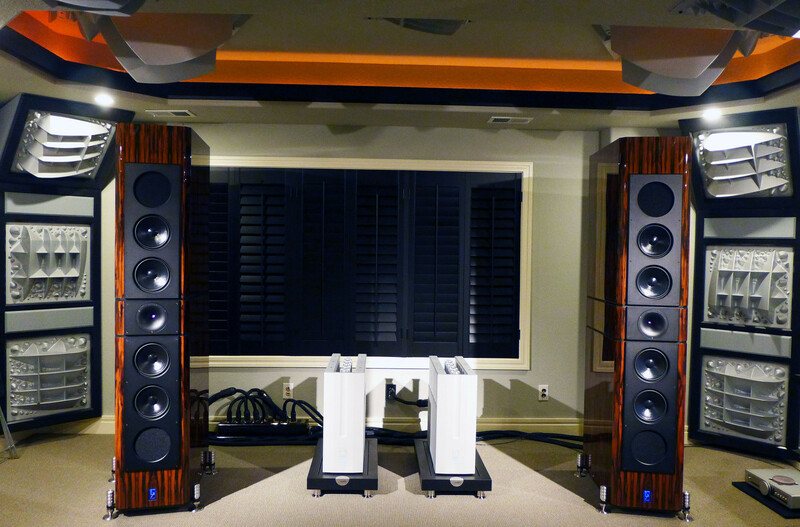 Placed 30 inches from the front wall, 58 inches from each side wall with 7 feet between themselves, the Lansche 3.1 was driven by the new Ypsilon Phaethon ($25,000) integrated hybrid power amplifier. The Phaethon sports a 11 to 75 kHz bandwidth, outputs 160 wpc into 4 ohms, has a 60 times gain, comes with one pair of balanced and three pairs of single-ended inputs. Two 6H30 tubes regulates input. The Ypsilon Phaethon weights 77 pounds and measures 15.8 inches wide, 16.7 inches deep and 7.3 inches tall. The coach was set at the tip of an equilateral triangle in relation to the Lansche 3.1s with over 6 feet of clearance behind the coach. The Lansche 3.1s were toed-in slightly. Digital source was via my 128GB Apple iPhone 6 with CD music ripped using the Apple iTunes software. Importing resolution of the iTunes was set at the 16bit/44.1kHz WAV-format level. The digital signal was then transmitted wirelessly via the iPhone’s Bluetooth aptx codec to an Audioengine B1 Premium Bluetooth Music Receiver. The diminutive Audioengine B1 received the digital signal then upsampled the incoming signal to 24-bit precision and outputted the analog signal via an AKM AK4396 chip to its RCA outputs. The digital signal is down-converted back to 16-bit resolution before outputting through the B1’s toslink jack. 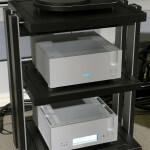 The digital signal was then fed to the Ypsilon DAC 100 ($29,000) valve stereo DAC. 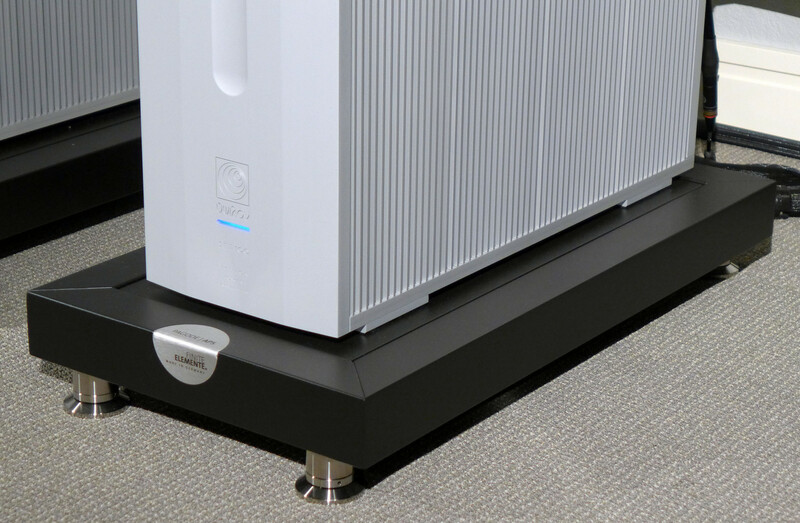 See the Dagogo Review on the 55-pound DAC. Since the Ypsilon DAC 100 doesn’t support toslink input, a toslink-coaxial converter bridged the Audioengine B1 to the Ypsilon DAC. 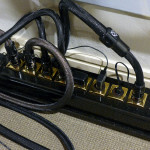 An Aural Symphonics toslink Digital Standard linked the Audioengine B1 to the t-c converter, while a Stage III Chimaera Ultimate Resolution Digital Link ($5,100/meter) connected the toslink-coaxial converter to the Ypsilon DAC. The Stage III Chimaera is constructed with a single Aerostrand Ultra palladium/silver alloy conductor with a silver braid return. There is a semi-vacuum in the dielectric inner core tube drawn to 675mm HG HDA foil/nickel plated braid shielding. Shielding is now enhanced by the use of multi-layer construction with ferrite, ceramic and high density alloy granules for enhanced mechanical damping and shielding. The housing is also enhanced with the use of custom handmade woven carbon fiber. 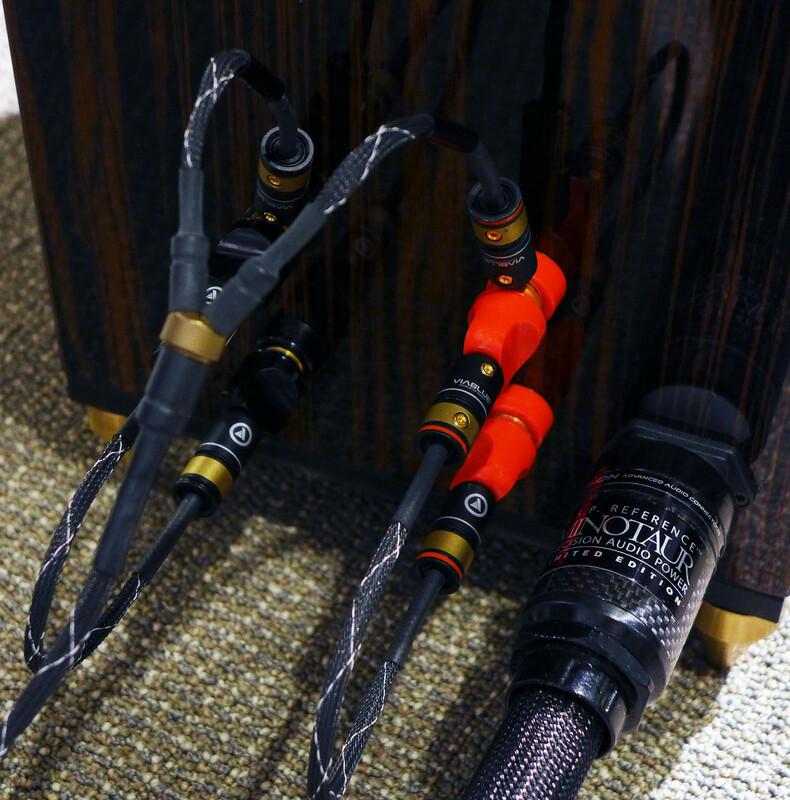 The cable is terminated with cyro-treated, Hyperion silver RCA or XLR connectors with ceramic-infused polymer insulators, custom made by Stage III Concepts. All Stage III products, including the Chimaera, are cryogenically treated. The same digital system was used as reference on both Lansche 3.1 and 8.2 system throughout my stay. 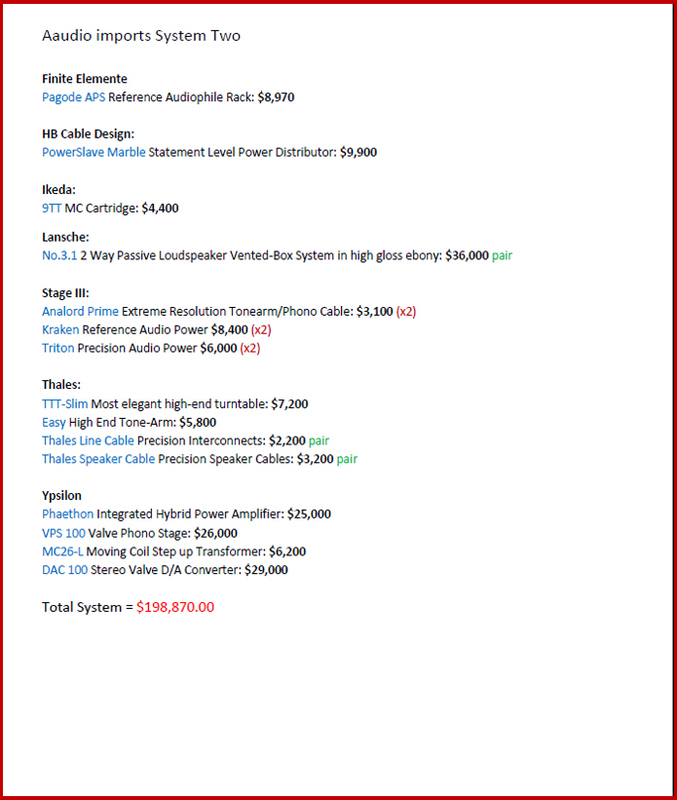 Click on the “System Two” PDF below for details on the rest of the system. The Lansche 3.1 as driven by the Ypsilon Phaethon was an overachiever for its size. 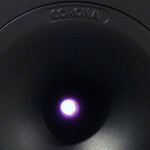 By virtue of the Corona ion plasma tweeter, the 3.1 behaved like a possessed engine spewing out gobs of information in the league of electrostatics, fully resplendent in the speed and effortlessness. Spatial scaling of orchestral pieces were the Lansche’s strong suits; strings and brasses were thrown onstage and seemingly occupying tremendous amount of spatiality. Turn it louder, sink deeper into the couch and the dimensionality just kept on unfolding. The old Acapella Triolon Excalibur that used to occupy this room also featured a plasma tweeter, and having written about it as well, I have to conclude on the definitive superiority these technological wonders of which are so capable in recreating the dimensionality of the recorded venue. After a day of listening to the 3.1, in an about-face, the coach got turned around and moved back to face the Lansche towers. The 8.2 features two 18-inch active woofers on its back! A pair of 1,200-watt internal amplifiers drive the twin woofers between 15 to 40 Hz. The notes are vented through the front for absolute phase coherency. A total of four 8-inch paper coated mid-woofers pressurize the listening space with information from 40 to 2,500 Hz. 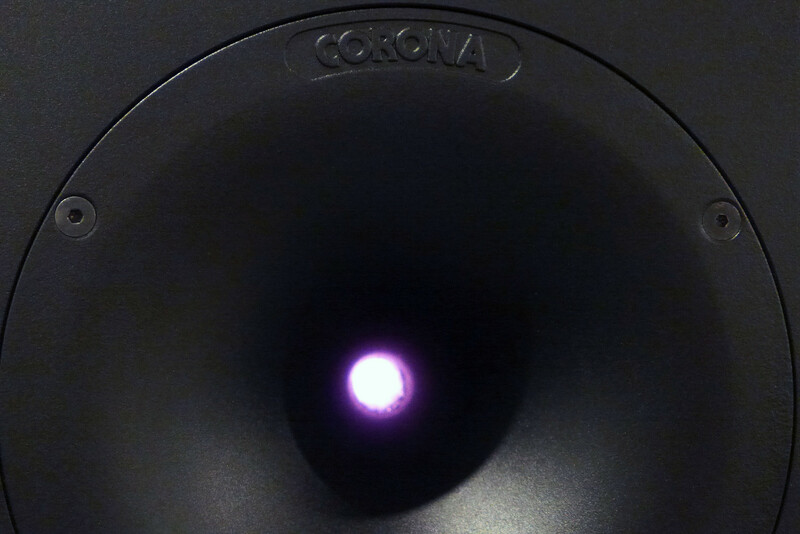 The Corona ion plasma tweeter takes care of everything beyond. Rated frequency response is 15 to 150 kHz. A Ypsilon PST 100 MKII ($37,000) combo valve & transformer preamp mitigated signals from the sources via a transformer attenuator with 31 taps. 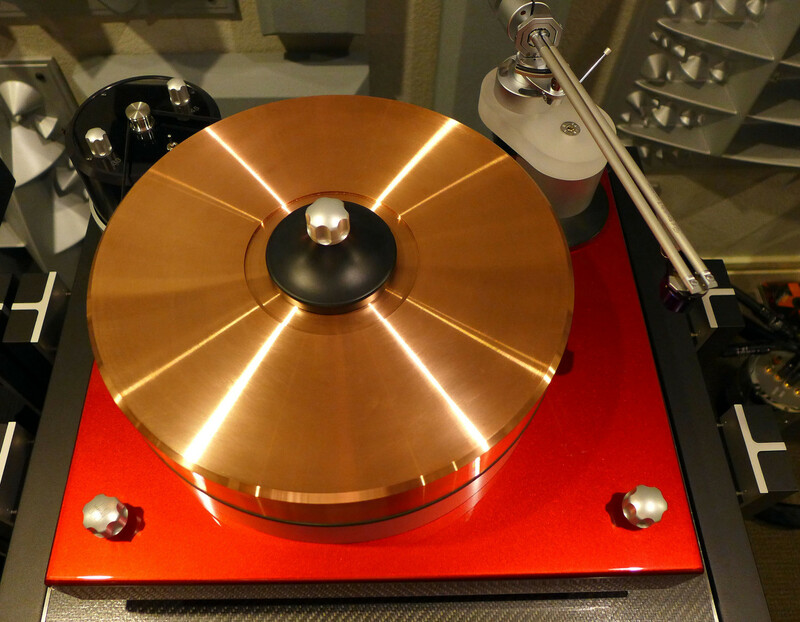 Preamplifiers using transformer attenuation is practically non-existent on the market. None of the major amplification houses uses it. The Ypsilon transformer attenuator is likely a device too costly to implement or technically difficult to put into mass production, and it is the only company undertaking the development and production of such attenuation method in-house at the highest level. Check out the specs: 52dB for maximum attenuation, 12dB maximum gain. A transformer-coupled, triode-rectified, choke-regulated power active gain stage precedes the transformer attenuator with custom silver wiring. This is certainly extreme and extravagant, although no more so than the PST 100 MKII Silver Edition due to be launched in the fall with the addition of silver wound transformers! The price will be doubled. 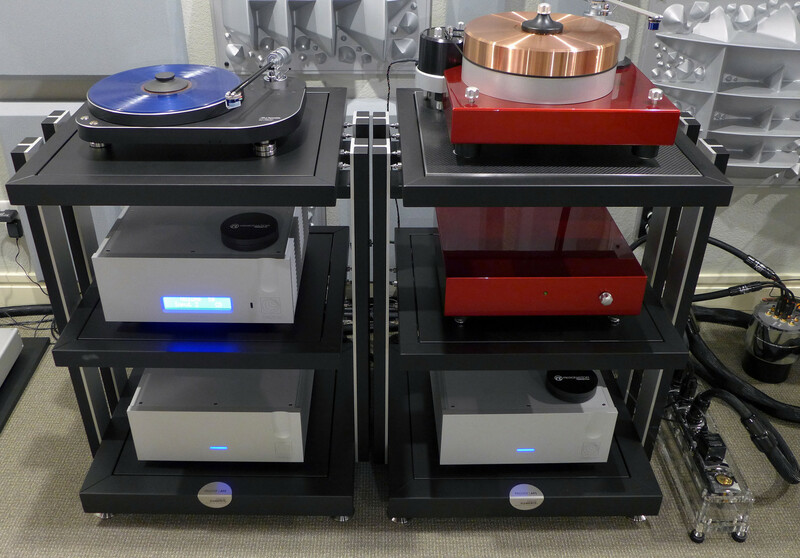 Analog and digital may go in a circle for the reign of day; a premium preamplifier will always be called upon. The Lansche 8.2 is rated at 94 dB efficiency at 8 ohms, and what a sonic tour de force it is. 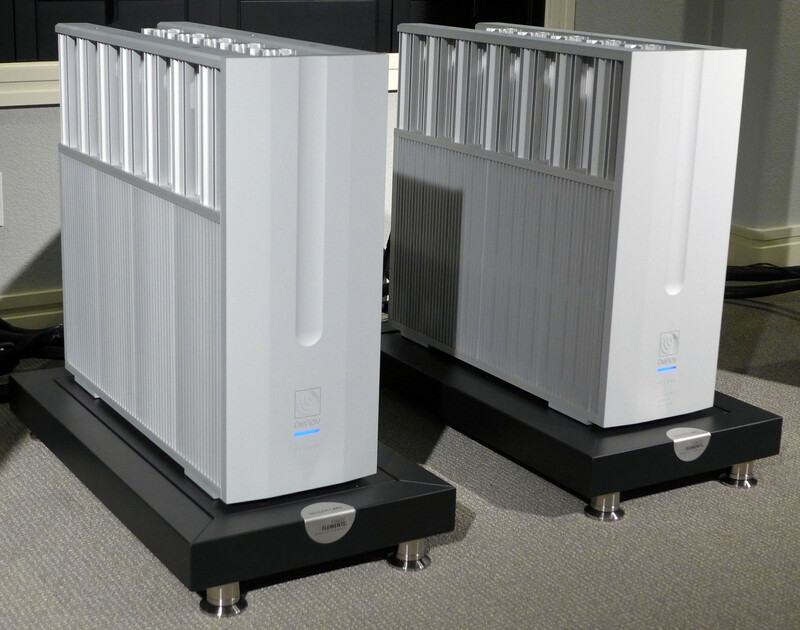 Brian drove them with the Ypsilon SET 100 Ultimate hybrid monoblock amplifiers ($125k/pair). 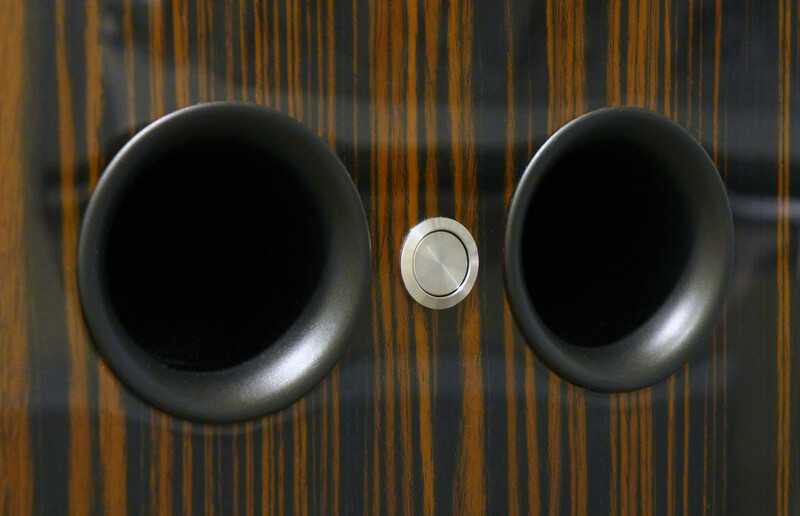 The Ypsilon outputs 120 wpc pure class A power into 8 ohms and covers the frequencies between 8 to 80 kHz. 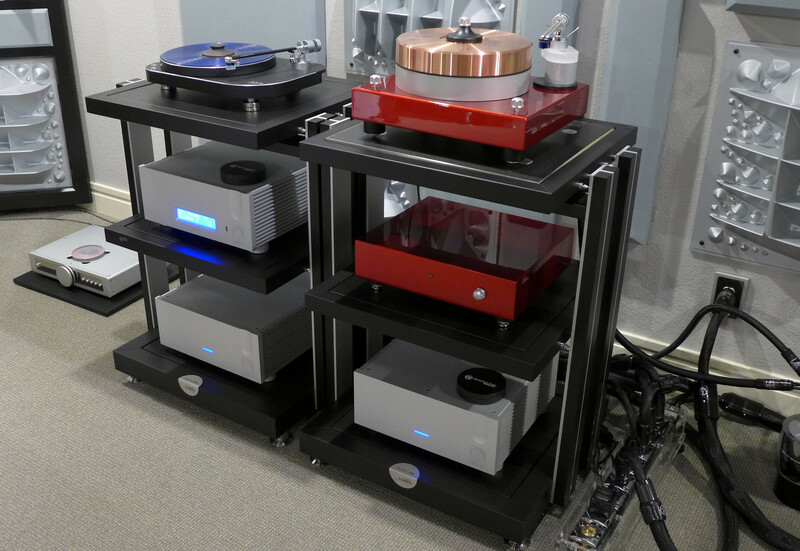 Each SET 100 Ultimate is 24 inches at full height, not counting the additional elevation as provided by the Finite Elemente Pagode APS reference audiophile amp stand ($3,570 each), while also resting on four of the Finite Elemente Cerabase Classic Precision Audio Footer ($1,060 for set of 4). 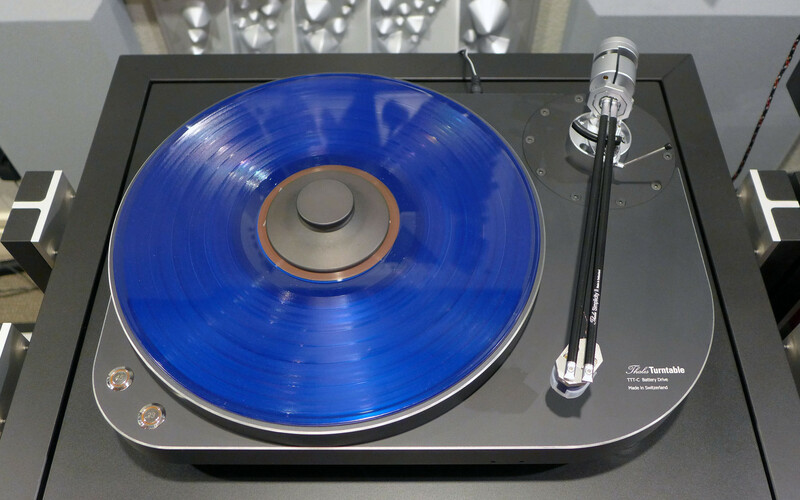 Analog source was via a Hartvig TT Signature Gramophone Turntable+Armboard ($29,700). 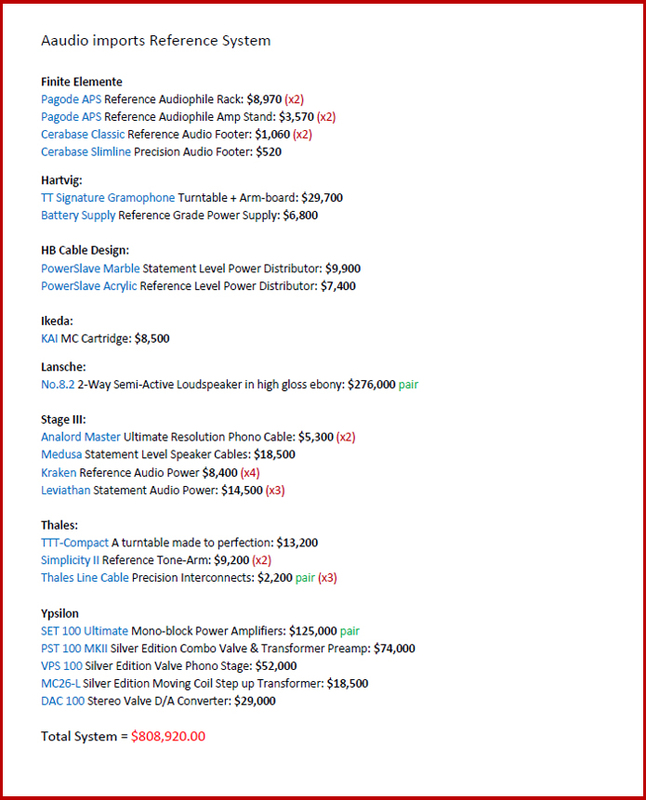 A Hartvig Reference Grade DC Power Supply ($6,800) provided power. 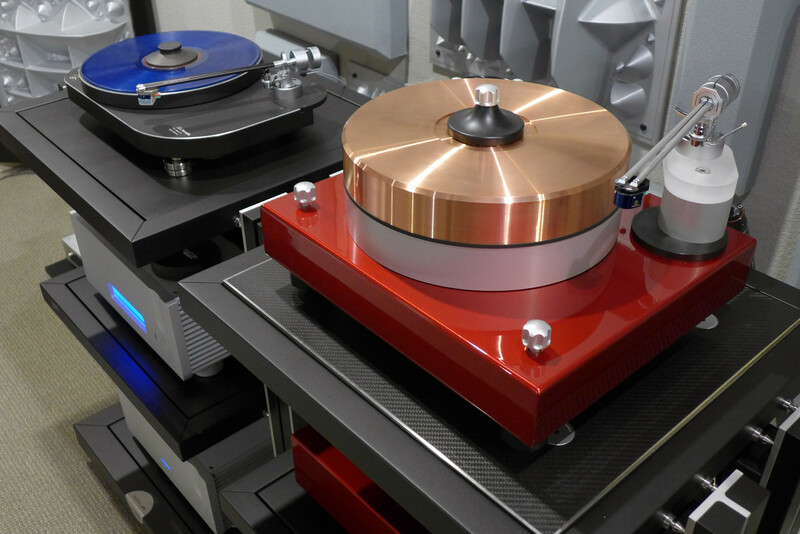 Cartridge was an Ikeda KAI MC ($8,500). 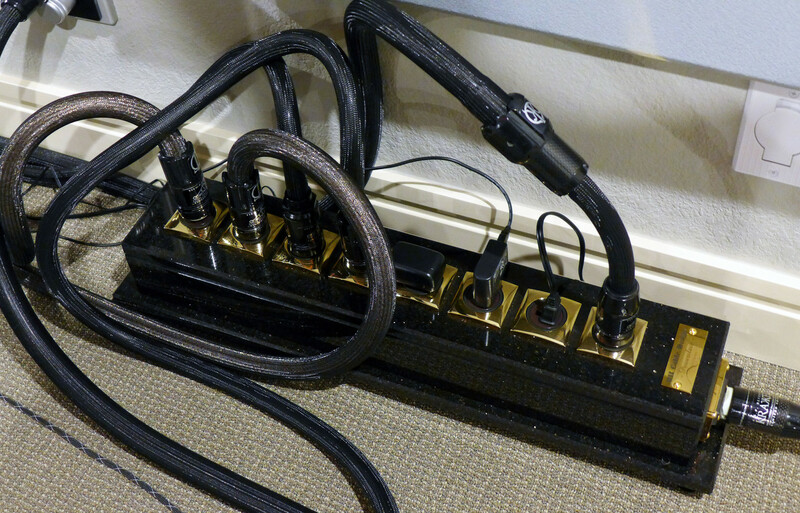 The Stage III Analord Master Ultimate Resolution Phono Cable ($5,300) completed the setup. 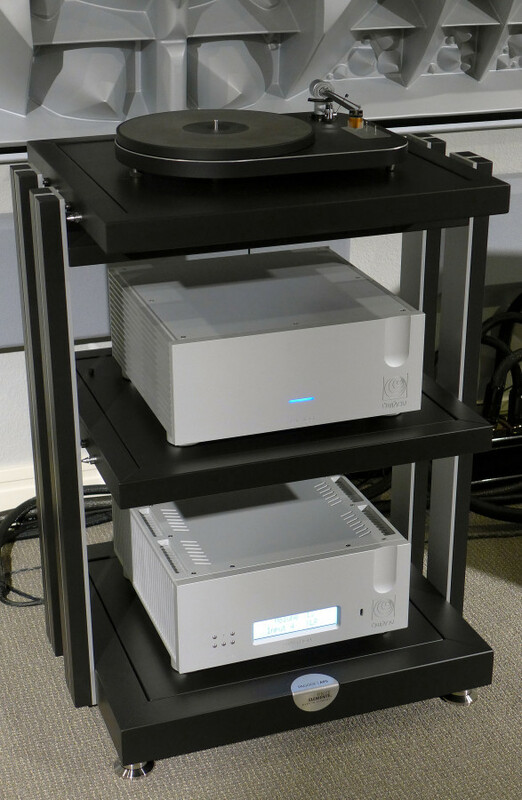 RIAA equalization and amplification was via the Ypsilon VPS100 Silver Edition phono stage ($52,000). This is the upgraded version of the $26,000 VPS100. 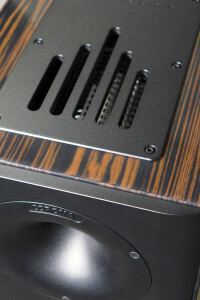 In the standard VPS100, there are already such revolutionary measures that sets the Ypsilon phono stage apart from others, such as the use of passive RIAA equalization to eliminate feedback loop inherent in active equalization on top of a transformer-based LCR (Inductance-capacitance-resistance) implementation of the RIAA equalizer with zero capacitor and resistor in the circuit, so as to eliminate contamination of phono signals from dielectric absorption. As if those extreme measures are still not enough, Ypsilon design and build its own transformer using special amorphous C-core material with paper winding insulation. Ypsilon claims the VPS100 is the most properly implemented RIAA equalizer and the result is a more natural, musical and open sound with better defined macro and micro dynamics. Who says money can’t buy happiness? 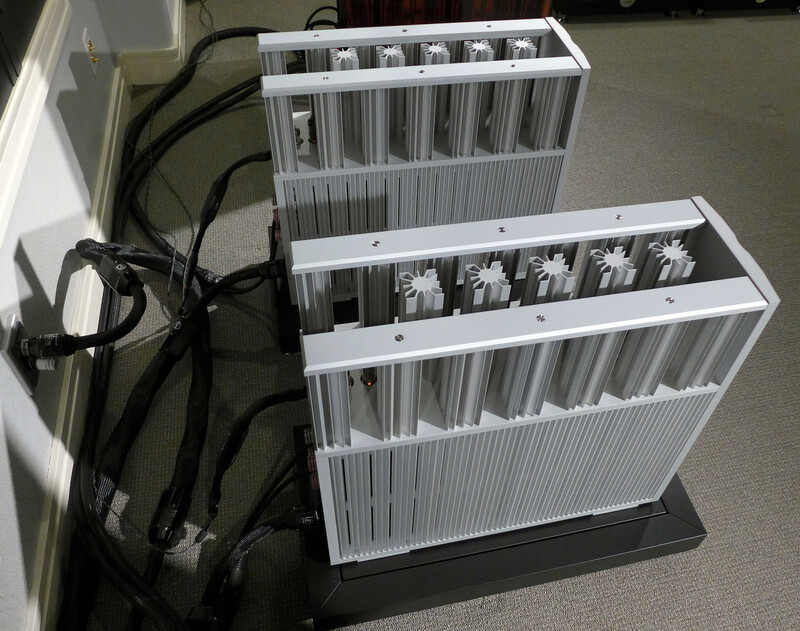 And there is more to the tube VPS100. Check out the link above. Extreme extravagance does not begin to convey the presence I was in. We are talking about a quarter-million dollar-plus speaker system not counting what it is being fed. Do you have a Lamborghini Huracan or Mercedes SL65 AMG in your garage? Why not get the Lansche 8.2, too? Because while you’re not driving around in your supercars, staying home and listening to the ultra sensational music produced by the Lansche towers will go a long way towards completing your life experience. The Lansche 8.2 and the 3.1 use the same ion plasma tweeter, but boy what a sound it makes in the company of the quadruplet of 8-inch mid-woofers. Sitting at a distance of 11 feet from the 8.2 while the speakers measured 9 feet apart from tweeter to tweeter, spectacular waves of lifelike dynamic scaling prevailed in a manner I have not experienced elsewhere, notwithstanding the fact that the Corona was now driven by the SET 100. The beautiful tone coalesced in mesmerizing details, such that emphasis on audiophile recording rewarded me with surreal listening experiences. 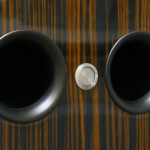 With the Lansche 8.2, the singular, decadent pursuit of the golden tone was real and fun. In addition, although the 8.2’s mid-woofers now carry an even wider spectrum of 40 to 2.5 kHz versus the 80 to 2.5 kHz in the 3.1, there are four to accomplish it, and what a sonorous four they are. This is the pinnacle of the audiophile experience. Same recordings played on the 3.1 are now giving up more intricate low-level details through the Lansche 8.2 towers, imparting greater precision in tonality that made the experience progressively rewarding. This also translates into more discernible and realistic dimensionality on instruments and voices. In the bottom-ends, the 18-inch subwoofers were not mere beasts of brute force. At times, they were quite subtle in providing the extra oomph that gave just the perfect weight and speed to the feverish fiddling of the double basses. 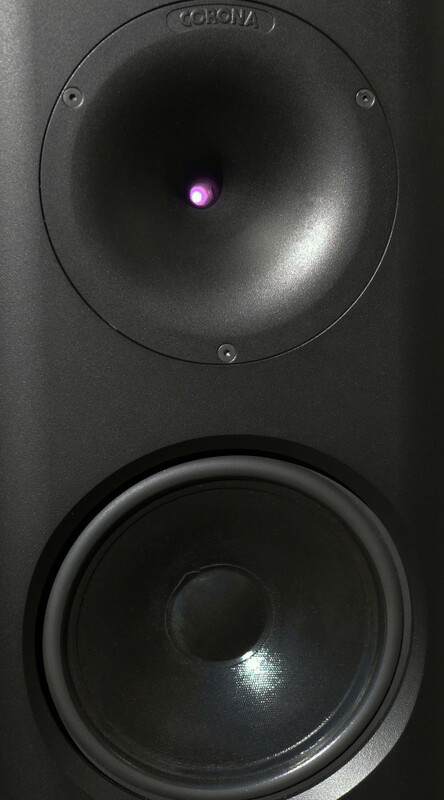 I’ve heard active speakers with extraordinary bottom-end force and yet lacking musicality and performing ordinarily in the midrange and top-end. The genius of the Lansche lies in the perfect balance stricken in creating a bottom-end experience both powerful and musical, on top of a million-dollar mid and high. Of course, I know, the 8.2 costs a quarter-million only. Life is full of extremities. There are budget systems and then there are cost-no-object ones. The marketplace allows for both types of companies to exist because we, the consumer as a whole, demonstrated appetite for both. In the ever merry-go-round of supply and demand, we are blessed by competent manufacturers developing products to an ideological budget, as well as those producing uberperformance, stratospherically priced systems. History has shown us that the advancement of human knowledge and technology will eventually trickled down to even the least developed of countries. By the same token, more and more manufacturers will eventually attain the same engineering height reached by the most advanced of them, slowly but assuredly. Therefore, may the ultra wealthy ones among us spend their fortunes and push the manufacturers to develop uberperformance systems, then let the truly worthy products find its place into our lives. May more of us bathe our spirit in the intensity of music and be at peace with one another.